Hmmm, attempt to get a first row seat for better pictures or stay in the last row so I can go to the bathroom without climbing over a dozen people? Rodeway is great because there'll be a lot of SHIMMER fans there. But, if you have a car, there's plenty of better hotels that are a short drive away, and if you use a Hotwire or Priceline, you can get it for 2/3 the price of the Rodeway. The Rodeway is as low as $70 a night after taxes. Last time I was booked to a Holiday Inn in Oak Brook for $47 a night after taxes. And I know I'm technically local too, but the home is just far enough away, combined with the quick turnarounds, and the sheer exhaustion of the shows, that I'd just prefer to be closer to the venue. If you stay at the Rodeway, though, be prepared to not get a good WiFi reception. There was one time I stayed at a closer hotel - there weren't any other SHIMMER fans there, but the WiFi was perfect. I'm coming - just got my airline tickets - the earlier the better seems to be the rule for saving money on airline tickets these days. I saw my first Shimmer show at Wrestlecon - really enjoyed it! With the seeming implosion of Chikara this week, it now seems positively stupid to skip an opportunity to see more great Shimmer action and support all the performers and the promotion. I'll be filling in a holiday form when I go to work on Monday and then it'll be time to start planning for my first ever SHIMMER show. Luckily for me, my birthday is a few weeks later so I'm going to make everyone give me money to cover flights, hotels etc. In situations like this, you need a valid excuse not to go. I think I have mine - as much as I love the SHIMMER athletes and everyone in the Eagles Club, it just so happens that Hiroshi Tanahashi is coming to my home town that weekend. Arguably the best male wrestler in the world, and for cheaper than a flight to Chicago and back. I simply can't pass that opportunity up. 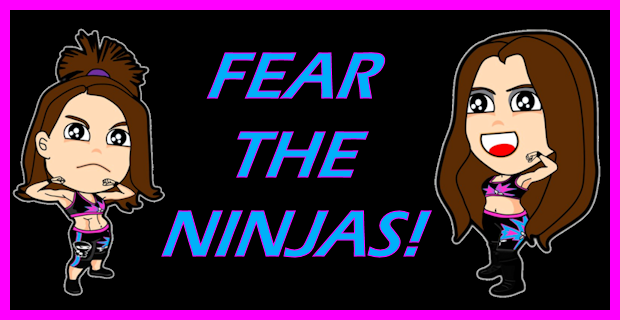 I will return though, likely in the Spring 2014 tapings. 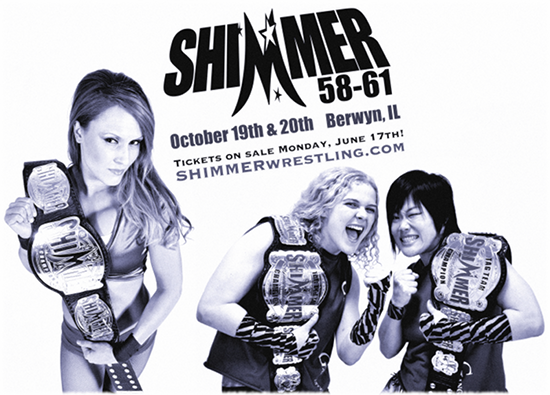 If you are interested in front row reserved seats for the SHIMMER 58-61 tapings, check back here tonight at 8pm Central time for instructions. For those unfamiliar with our process, since there are only 67 front row seats available, we must first approve your specific ticket request before accepting your purchase. The front row tickets typically sell out very quickly, so this is the only way for us to handle the demand in an orderly way. We will begin accepting ticket requests at 8pm Central time tonight. We will then respond to your request with payment instructions, if there are still enough front row tickets available to accommodate you. We will also put general admission tickets up beginning at 8pm Central tonight. What does 'general admission' constitute? I'm thinking of getting a seat a row or two back, but as this is going to be my first time going I don't know (a) how many rows there are, exactly; and (b) what those sorts of seat would come under. The only reserved seats are front row. GA is first come first served for all other seats when they open the doors to the Eagles Club. There are 2-4 rows of seats behind the front row on each side of the ring. Ah, fair enough. Cheers for clearing that up. This is a welcomed distraction from the Blackhawks game! This is more nerve-wracking than trying to get tickets for Comic-Con.